KICK OFF PARTY is FRIDAY, OCT. 7TH, 6-9 PM, 150 Pacific Ave. 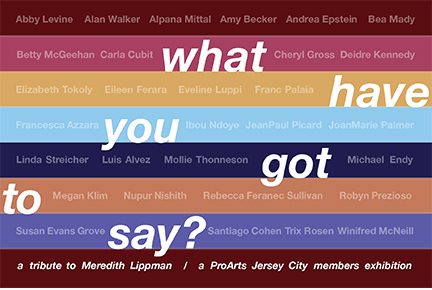 This year’s Pro Arts Jersey City Membership Exhibitions are in 2 locations: the 150 Pacific Ave. Flagship and 125 First St. City Life Gallery. Please join us in dedicating these exhibits to Meredith Lippman, who was a guiding light to the visual arts for Hudson County and Pro Arts in particular, as a past president and active board member. The exhibits, entitled, “What Have You Got to Say?” are based a series of exhibits that Meredith organized and curated with Jim Legg and Garth Kobal that focused on current political issues. For this tribute Pro Arts invited its members to make their own interpretation of the title and offer their best work to her memory.